A new liver scanner which gives patients instant results and avoids the need for an uncomfortable and potentially harmful biopsy, is now installed and up and running at Sandwell Hospital. The £70,000 scanner, which measures the elasticity of liver tissue, has been bought for patients at Sandwell and West Birmingham Hospitals NHS Trust by a combination of donations from Sandwell Primary Care Trust (PCT), the Hospital’s League of Friends and a local charity that supports upper gastrointestinal and liver cancers – Upper GI Blues. Consultant, Dr Saket Singhal, explained that the new machine, which is used to measure the health of the liver, would be of benefit to patients with many types of liver disease, including those with viral hepatitis, fatty liver disease and liver disease due to alcohol. As well as two consultants, Dr Singhal and Dr Ed Fogden, being trained to use the scanner, Specialist Nurse Clare Smith has also undergone training and uses the machine in clinics with her patients too. £5000 was also donated by Upper GI Blues, a local charity that works with and for people who have suffered gastro intestinal and liver disease. Dr Singhal will meet with the group, and the League of Friends, in coming months to talk to them about how their contribution will make a difference to lives of local patients, a task he said he is delighted to be able to do. 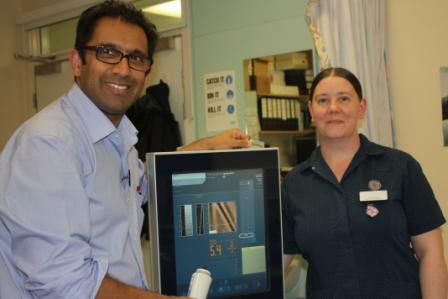 Caption: Dr Saket Singhal and Specialist Nurse Clare Smith with the new scanner.